There's a beautiful exhibition of Dorothea Lange's photographs at the San Francisco Public Library in the Skylight Gallery up on the sixth floor. 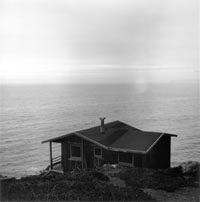 It's photos of her cabin at Steep Ravine perched on a cliff overlooking the Pacific Ocean. Terrific. On Tuesday, Feb 19th, my sister Meg will be showing her film, Dorothea Lange: A Visual Life, at 6 pm in the Koret Auditorium. My dad and I will be there with her to take Q and A after the film. My dad, Rondal Partridge, was her assistant when he was young. We all were folded into the family and used to spend sunny days and windy nights out at the cabin with the Taylor-Lange-Dixons.